The significance of medieval ceramic production in Syria is not yet fully understood. 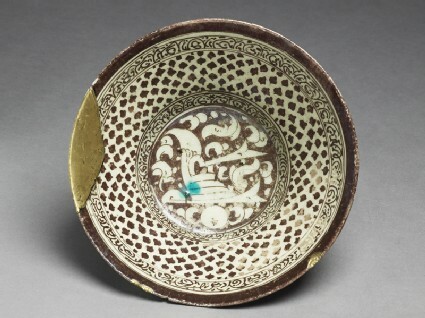 The production of lustrewares, however, is amongst the most widely documented in the region, and the decorative glaze effects display a distinctive style when compared to Egypt or Syria. This bowl’s decoration of a single, central epigraphic motif, placed against rich foliage is found in several examples attributed to the two most prominent Syrian centres, Raqqa and Tell Minis. The precise origins of the medieval Syrian lustre industry are uncertain, though it probably derives from the Fatimid Egyptian tradition. One school, associated with Tell Minis in northern Syria, is often characterised by figural designs; that associated with the city of Raqqa on the Euphrates, of which the two opposite are examples, tends towards vegetal patterns or calligraphy. In the latter case the lustre is often rather chocolate in tone. On these two bowls, the artists (or perhaps artist?) have taken the Arabic word al-surr, ‘happiness’ and, combining brush strokes and imagination, have created two very similar, bold designs, each of which strongly suggests a peacock. The contrast between the two is quite marked, however, the one [EA1978.2175] being tightly controlled and static in impact, the other [EAX.3068] far more fluid and fluent, almost with a life of its own.